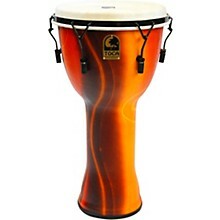 The Toca Mechanically Tuned Djembe has a lightweight and durable seamless synthetic shell that sounds great and travels well. 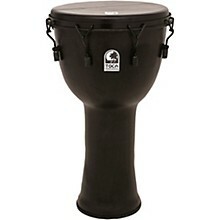 The djembe's low mass tuning system allows fast, accurate tuning that stays in place. Protective rubber bottom and tips on tuning lugs protect your floor's finish. 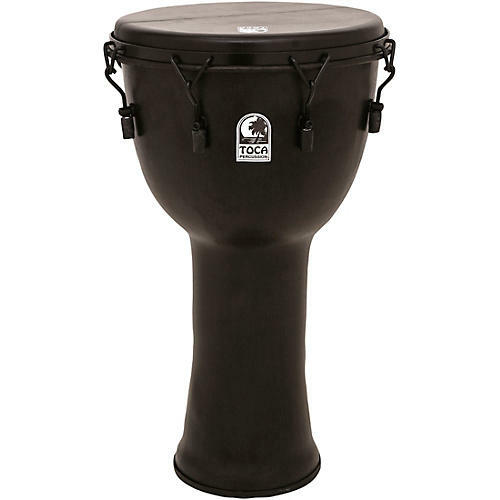 The drum's black finish with black hardware gives a striking look to go with its dynamic sounds, including an authentic goatskin head finished in black dye. - For head replacement service on rope tuned drums for the East Coast, please call Everyone's Drumming for a quote: 1-800-326-0726. Prices start at $85. For warranty evaluation and parts replacement please visit your place of purchase or any Toca Percussion dealer. This warranty extends only to defects in materials or workmanship as limited above and does not extend to any product which has been lost or discarded, by accident or improper maintenance; or which has been altered; or which has been repaired or modified by a non-authorized person or company. This warranty does not apply to any owner other than the original purchaser; any defects caused by reasonable use, neglect, moisture and/or temperature extremes, handling, shipping or accidents; natural wood finishes or normal color changes of wood or shell covering material. Under this warranty repair or replacement of parts is the only remedy, and loss of use of the products, loss of time, inconvenience or consequential damages are not covered. THIS WARRANTY IN LIEU OF ALL OTHER WARRANTIES, EXPRESS OR IMPLIED, INCLUDING, WITHOUT LIMITATIONS, THE IMPLIED WARRANTY OF MERCHANTABILITY OR OF FITNESS FOR A PARTICULAR PURPOSE. 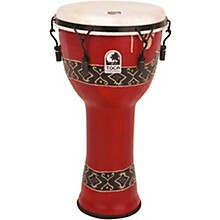 IN NO EVENT SHALL KAMAN MUSIC. BE LIABLE FOR CONSEQUENTIAL OR INCIDENTAL DAMAGES. FOR CUSTOMERS OUTSIDE THE UNITED STATES, PLEASE CONTACT YOUR TOCA DISTRIBUTOR.